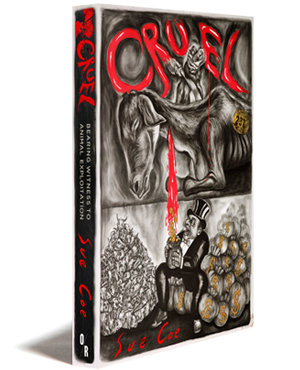 Artist and activist Sue Coe's new book "Cruel" will be released this month, along with an event in NYC and a gallery show the following week. According to OR Books, "Cruel conveys the terrible beauty, and intense suffering, of both the animals so sacrificed and the workers involved in their violent destruction. While unexpectedly beautiful in its depiction of the brutal consequences of meat eating, this is a deeply moving, upsetting work, not for the faint of heart. " Sue Coe will be present to sign books. Moo Shoes will donate 10% of sales to one of Sue’s favorite non-profits, United Poultry Concerns, a nonprofit organization dedicated to the compassionate and respectful treatment of chickens, turkeys, ducks and other domestic fowl.